STANDISH — Saint Joseph’s College hosted an out-of-this-world event in early August with the Maine Space Grant Consortium. Based in Augusta, the consortium is funded through NASA and encourages Maine students to participate in the fields of science, technology, engineering and mathematics, or STEM. Included in that work is the Maine Research Internships for Teachers and Students program, also know as MERITS, which provides high school juniors from Maine with a paid research internship over the summer. The group holds an annual “Celebration Day” to showcase the work done by MERITS students, and this year’s event was at Saint Joseph’s on Aug. 3. Jana Hall, the controller and director of education programs for the consortium, said this was the first time the celebration day has been held at the college in Standish in the program’s 10-year history. Ten students participated in the program this year. That team grew out of a $20,000 NASA grant the school received through the consortium aimed at introducing satellite science and building nanosatellite prototypes in physics courses at the college. Working with the nanosatellite research team this summer “gives me hands-on experience and an opportunity to confirm my interest in STEM,” she said. 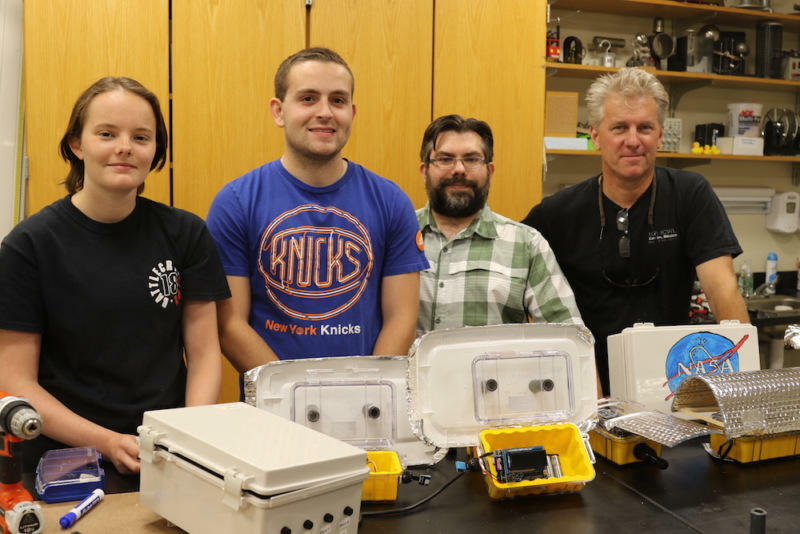 Other institutions that hosted MERITS students this year, included the University of Maine, University of Southern Maine, Colby College, the Wells National Estuarine Research Reserve, RLC Engineering, and Mobility Technologies, according to the college..
Members of the Saint Joseph’s College nanosatellite research team, from left, Annie deCastro, Kevin McWilliams, Dr. Ryan Dorland and Dr. Steve Jury.